PHOENIX – Denise Carroll said she was petrified when her son, Bobby Ciafullo, told her he wanted to play football for Desert Mountain High School in Scottsdale. “You know, you hear all these things about concussions,” she said. But she was relieved when a coach told her that Desert Mountain uses a program that teaches players how to avoid concussions by avoiding helmet-to-helmet contact. Today she’s a volunteer with Scottsdale-based SafeFootball, which works with high schools and youth sports programs around the Valley as well as with Arizona State University’s football team. 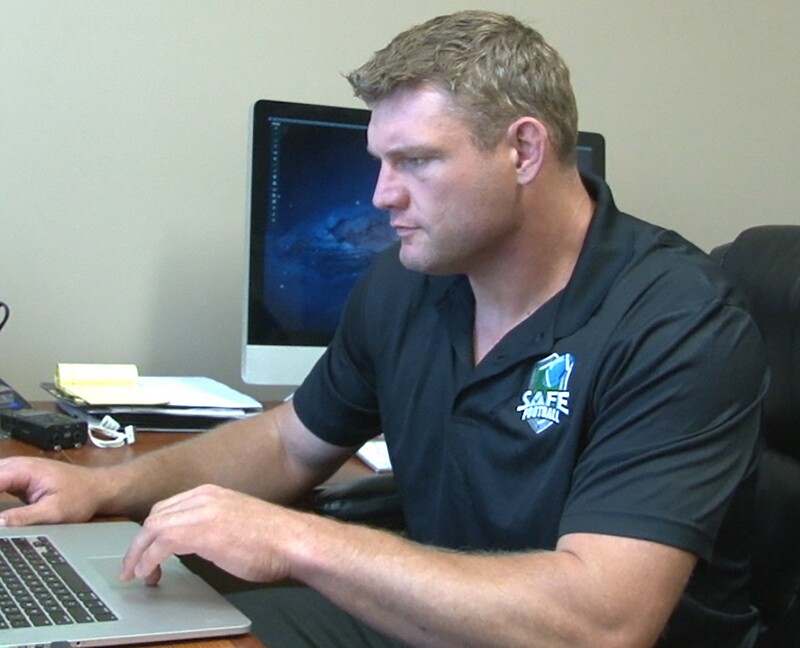 Scott Peters, a former ASU and Arizona Cardinals offensive lineman who founded SafeFootball, said that with no cure for concussions in sight he focuses on prevention. “The game should be played with hands, not heads,” Peters said. The techniques, taught first to coaches and then to players, focus largely on contact before, during or after tackles. 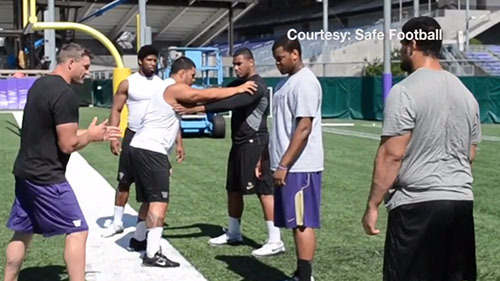 Rather than assuming more of a horizontal angle that initiates contact with helmet and shoulder pads, SafeFootball teaches players to use their hands and leverage to gain the advantage. “Our techniques are more conducive to what are our body does than the old methods, where you are leaning like a caveman and running head-first,” Peters said. Participants pay for the training. Peters declined to say how much but said it varies by what the job requires. Richard Taylor, head football coach at Centennial High School in Peoria, remembers when that was how the game was played. “Forty years ago, if you did not lead with your head and hit someone with your face, you were not considered a very tough football player, ” Taylor said. That’s changed at Centennial through SafeFootball, he said. “They learn how to use their hands instead of their face thus, it keeps their head safe,” he said. Steve Bailey, a junior who plays on Centennial’s offensive and defensive lines, said he’s trying to break the habit of leading with his head. For Bobby Ciafullo, learning these techniques in high school ultimately landed him a starting position on the offensive line of Pomona-Pitzer College’s football team in California. SafeFootball started working with ASU’s football team this season, a collaboration confirmed by Sun Devil Athletics. Peters said he educated Head Coach Todd Graham’s staff on his techniques. Dr. Amaal Starling, a neurologist with the Mayo Clinic, said it’s important that SafeFootball is teaching these techniques to young athletes. Peters said that in addition to promoting safety, SafeFootball’s techniques give teams a competitive edge. “We can be more effective and win,” he said. A new program called SafeFootball is teaching students how to reduce the amount of concussions by avoiding helmet on helmet contact. Cronkite News reporter Bethany Reed has the story. 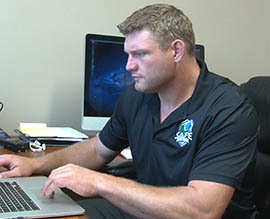 Scott Peters, a former Arizona State University and Arizona Cardinals lineman, founded SafeFootball.